The Canary Islands consist of seven large islands and six smaller ones, stretching 500km (313mi) east to west and 200 km (125mi) north to south. While Lanzarote is undoubtedly the best bet for world class conditions, Fuerteventura conceals many short, sucky lava reefs alongside the long sandy beaches that attract so many windsurfers. The island’s name comes from Fuerte (strong) and viento (wind). Every year in August, the world speed windsurfing championships are held while the biggest surf contest was the 1998 longboard world championship. This volcanic island only recently emerged from the Atlantic, is the second largest of the Canary Islands and the least developed island accessible by plane. Tenerife and Gran Canaria were first surfed by US servicemen in 1970 and word quickly spread, leading explorers to the easterly islands and their powerful, Pacificesque reefbreaks. There are 152 beaches including those on Isla los Lobos, amounting to 50km (31mi) of white sand and 25km (16mi) of black sand and shingle, but this accounts for a mere 22% of the total coastline of Fuerteventura. The best surfing spots in the north are between Corralejo and Cotillo, around a dirt road known as the 'North Track'. Most surfers stay in Corralejo because of the plentiful amenities. Fuerteventura presents an arid, almost lunar landscape and is home to far more sandy beaches than the other islands. Strong winds are part of the deal, making this island a world-renowned windsurfing spot, but there are plenty of waves to be found in the calmer winter months. The north coast is packed with exposed reefs that pick up all the swells from W round to E and the waves range in intensity from the challenging tubes of Lobos to the mellow walls of Derecha de los Alemanes. The long west coast offers open, rock-strewn beachbreak that is offshore in NE winds but anywhere south of Cotillo is isolated and currents can be extreme. The far south has a couple of quality set-ups waiting for the right conditions but it is a long drive down and the chance of getting skunked is high. The east coast is surfed up near Corralejo where bright white sands cover some nice little reefs and beginners can get some space but if the NEÕer is blowing then the wind and kite rigs will be flying all over the place. Summer can get surprisingly big on the east coast and there is potential for exploration but it is usually onshore. The depths of winter are going to be the best bet when the wind is lighter and more E than N. Early starts are advisable to beat the wind and the crowds, while siesta time matches the strongest wind period of the day. Summer can still have some good waves at the west and east coast beachbreaks. Fuerteventura and Lanzarote claim the best consistency in the Canaries due to their superior exposure to the N-NW swells that churn the North Atlantic from October to March. Most exposed reefbreaks will average 4-12ft (1.2-4m), the major waves being produced by the deepest lows slamming into Western Europe. Even small systems off of the US East Coast can send some swell to the west coast. Summer trades can produce surprisingly big east coast surf but it is usually very disorganised and wind blown Rare south swells are pushed in by strong winds in the late summer. The best conditions occur when the NE trades activity is low (Nov-Jan). In the early surf season, winds tend to blow more E-NE than N-NE until the trades get strong and regular from March. April to September gets very windy and the surf is usually small and erratic, so look hard for the right wind/swell combination. The 15km (9mi) channel between both islands focuses the wind on the North Track spots. Tides matter over sharp, shallow reefs with spring tides up to 6ft (2m), so get a chart from one of the many shops in Corralejo. Fuerteventura enjoys a semi-arid subtropical climate, temps rarely dip below 20ºC (68ºF) and it hardly ever rains. Fuerte has the best sunshine of all the Canary Islands with an average of 2,938 hours/yr. Being only 84km (53mi) from the African coast, most of the east coast of the island is covered by white sand, blown in on Saharan winds. The worst phenomenon is ‘La Calima’, a strong E wind bringing downpours and red dust all over. The high wind factor raises the wind chill probability, in and out of the water. Combined with the coldish Canarys current, this means most winter days require a light fullsuit with occasional springsuit sessions in windless periods. Enjoy the semi-desert environment, and quiet holiday vibe. Try the Glass Bottom Boat to Lobos, the Camel Safari based at Jandia or visit Fortaleza del TostÛn. Great pubs and clubs as well: Corkys Surf Bar, Waikiki Club and Oink surfbar show latest surf vids. Shallow reefs, urchins, razor sharp lava are the No1 threats. Driving on the North Track is sketchy. Break-ins have been reported in Cotillo. 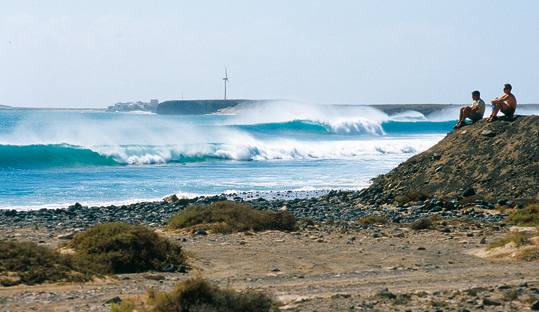 Localism is the lowest in the Canaries, but Lobos can get aggressive. Beware the wavesailors jumping and surfing.